On Jordan’s short stretch of Red Sea coast, there are 400 species of coral and 500 species of fish. But, pollution is threatening the biodiversity of the region. It has in part been created by the tourism industry, which the local economy depends on. Abdulla Momany is a master dive instructor and the manager of the Red Sea Dive Centre in Aqaba. He remembers when he started diving as a child in the reefs near the Saudi Arabian border. Back then, the waters were almost pristine and the marine life was more diverse and plentiful. At that time, Aqaba’s population was 50,000. Now it is 200,000, and growing. “There are more tourism investments, there is more industry and the port is getting bigger,” he tells SBS. According to Abdulla, the main problem facing the Red Sea is the international and domestic tourists who fail to respect the environment. The National Diving Team clean up waste from the Red Sea. “Unfortunately, they will visit and have a picnic and usually leave their trash behind and with the wind, it is thrown all to the sea,” he says. In the reef off Aqaba’s South Beach, we find plastic bags and drink bottles caught in the coral. From Abdulla’s boat, we can see rubbish blowing across the sand between the rows of deck chairs that line the beach. The National Diving Team program was established to clean up the reef. A number of professional divers from different centres and NGOs gather at a different reef every fortnight to collect the waste lying under the water. From Abdulla’s boat, we can see rubbish blowing across the sand between the rows of deck chairs that line the beach. The problem isn’t industrial pollution. Aqaba is a busy port, and container ships and freighters pass through the gulf each day, but a ‘Zero Discharge Policy’ is enforced so the vessels don’t dump anything in the sea. According to Abdulla, the ships are very well regulated and controlled. “Even the waste water of the ship, where they drop out – we take samples to the labs and see the results. It’s very well controlled. We have no waste or no oil spills,” he says. Abdulla studied marine biology and taught scientific diving at the local university. He has been on over 7,000 dives and says there are always new discoveries in the sea. “It’s still very special, it’s still unique and beautiful but of course not as perfect, and the density of the marine life is not as solid as it once was,” Abdulla tells SBS. Pollution is threatening the biodiversity of the region. It has in part been created by the tourism industry, which the local economy depends on. The Red Sea is a popular dive destination and very well-known because of the tropical waters, the temperature and the near-perfect visibility. “We are here the northern part of the Red Sea and thankfully not affected by global warming,” Abdullah says. 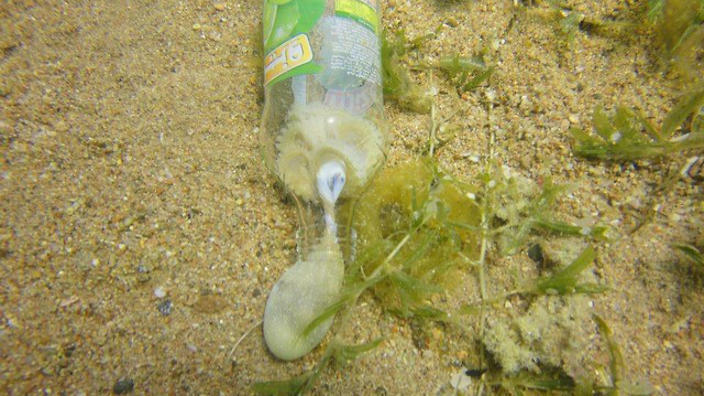 An octopus is caught in a plastic waste bottle off the Red Sea. As a result, water temperatures in S=summer reach a maximum of 28 degrees celsius and only drop to a minimum of 22 degrees celsius over winter. This is the perfect temperature for coral growth and the reason the Red Sea has such diversity. Nedal M. Al Quran is the manager of the UN funded Integrated Coastal Zone Management project, which seeks to mainstream conservation programs along Jordan’s Red Sea coast. He maintains that there is still rich marine biodiversity in the Aqaba Gulf. Nedal says rubbish generated by beach-goers and local tourists, and the garbage disposed into the sea from boats, are the main environmental issues facing the Gulf. “We have rich marine diversity; it’s unique, especially in terms of quality in comparison to our neighbouring countries on the Gulf." “The people of Jordan are educated but we still suffer the level of awareness in some groups who are still not up to the necessary degree of understanding, so, many NGOs focus their activities on raising awareness,” he says. “We have rich marine diversity; it’s unique, especially in terms of quality in comparison to our neighbouring countries on the Gulf,” Nedal says. However, he is pushing for locals to make more of an effort “to keep it safe and to maintain this quality”. In 2002, Aqaba was transferred into a special economic zone. On Jordan’s short stretch of Red Sea coast there are 400 species of unique coral, like this one. This brought new projects and major developments. “We have prepared a State-of-Coast Report, and it’s the first time in the region, we prepared a Sea-User Plan, which specified the different uses along the coastline,” Nedal says. The Aqaba Marine Park, which is a government entity managed by the local authority, is carrying out educational and awareness activities on the importance of the marine environment. “The annual budget allocated for The Aqaba Marine Park is about 0.7 million JD,” Nedal says. Back on his boat, where a group of divers is exploring a vessel that has been sunk to create an artificial reef, Abdulla says he is confident the region can overcome its issues. He also maintains his enthusiasm about the pastime he loves. “When you go under the sea, you forget about all the problems in the world and you just enjoy a totally new world,” he says.